Arcam's first ever HD audio AVR has arrived. Was the wait worthwhile? Arcam, maker of the AVR600, often seems to work in ways that are fundamentally at odds with other companies of its type, because while it has turned to Far Eastern factories to manufacture some of its products, the engineering remains strictly homegrown. You see, Arcam has a passion for generating its own often startlingly-innovative solutions for components that others can supply off the shelf, and this gives it a certain freedom that it has long exploited, for example, in designing the only British cassette deck with Dolby S (in fact the only domestic cassette deck, full stop), the first DAB tuner, the first standalone D/A converter, and more. Not that all these products were successful commercially, some indeed were spectacularly mistimed – thankfully, the eagerly awaited AVR600 AVR isn't one of them. This gleaming, beautifully-finished new addition to Arcam's FMJ stable is a sophisticated AV receiver that follows a root and branch re-examination of the usual choke points of AV amplifier design, and introduces a number of key technologies to the Arcam range. It is the culmination of a three-year project, Arcam's biggest ever; the design alone involved writing 1.5 million lines of computer code. The result is spectacular, unconventional and at times quite startling. Like some of its newer rivals, the AVR600 sets out to tackle head-on the normally horrendous level of audio jitter that afflicts HDMI. Traditionally, audio in the HDMI interface doesn't have its own clock – it's shoehorned into the video signal waveform – and the challenge for Arcam was to reduce jitter to the level associated with good CD players, which has been achieved with some novel design courtesy of a new Wolfson SPDIF receiver, and some fancy footwork with the surrounding clock recovery circuits. Another issue with a home cinema amplifier is heat management. Multiple channels operating at once tends to mean very-hot-running amplifiers and losses of output power. What marks the AVR600 out is that it's a Class G amplifier – an analogue (not digital) technology that involves some clever jiggery-pokery with the power supply high-voltage rails, with the aim of minimising heat dissipation while preserving sound quality and power yield. The benefits are comparable to those available from digital amplifiers in terms of heat dissipation and efficiency. This gives the AVR600 some green credentials, but without the collapse of power output into multiple channels heard with most analogue amplifier circuits. In combination these developments give the AVR600 better power delivery and lower audio jitter, but there is more to the AVR600 than these things alone. Unsurprisingly, the Arcam packs the latest surround sound codecs aimed primarily at Mr Blu-ray user – Dolby Digital TrueHD, DTS-HD Master Audio and their associated stablemates, although passes on Dolby Pro-Logic IIz height processing and THX post processing. More unusual is Dolby Volume, a sophisticated compression technology designed to equalise sound levels, between programmes and ad breaks. This also transpires to be a genuine boon when mix and matching a variety of sources. There's also a Cinema Mode which crunches the dynamic range of a soundtrack together for late night listening. This should not be used as a default, as the dynamics fall away. The AVR600 is custom install-friendly, too, with multiple 12V triggers, IR receivers, multi-room/ multi-zone capability, and an almost insane array of inputs and outputs. The receiver can upscale (or even downscale if necessary) virtually any input from composite video to 1080p, as long as it is a legal operation not prohibited by mandatory copy protection issues. Of course, it supports USB based audio and iPods. In addition to an FM receiver, there's a DAB tuner and internet radio. Although there are a lot of sockets, I encountered no special configuration problems with the AVR600; the uncomplicated (and graphically unambitious) user interface allows ready access to settings, with an easily understood front-panel control system. There's a simple-to-use microphone assisted setup and an intuitive remote control. Much of my listening used Yamaha speakers – the Soavo-1 and Soavo-2 as front and rear speakers respectively, with an Onkyo D-312E, a two-way compact, pressed into service as a centre speaker (this model is a strikingly good voice match for the Yamahas), and a Monitor Audio PL-12 subwoofer. Blu-ray and other DVD replay came from a Denon DVD 2500BT transport, and an Infocus DLP projector was used. Finally, a pair of Monitor Audio PL-300s were plumbed in for two-channel stereo listening. Digging into every aspect of the AVR600 will take a user some time, but the exploration should prove enjoyable. Working my way through the key features and operating modes yielded results which ranged from merely acceptable (the FM radio and, inevitably the DAB tuner) to hackle-raisingly excellent (most of the surround codecs, including Dolby TrueHD). The latter come into its own with Cloverfield, a bizarre but well-made piece of baloney, which is full of surprise changes of audio perspective and dynamic range. With a lossless codec like Dolby TrueHD, the Arcam is undeniably compelling, and occasionally shocking in a way that Dolby Digital could never hope to be. With other more straight-laced material, including Blu ray versions of Earth (chosen primarily for its stunning visuals), and Quantum of Solace (which wasn't), the Arcam strutted its stuff well, and showed just what a thoroughbred it is. Beneath the lid, the AVR600 uses a single IC featuring eight Crystal Semiconductor DACs; chosen for simplicity and uniformity of sonic quality. When asked why no Wolfson DACs, usually the preferred high-end option, Arcam revealed that its upcoming processor variant, the AV888, will feature eight Wolfson 8741s. Not that I believe there is anything lacking in the Crystal designs. 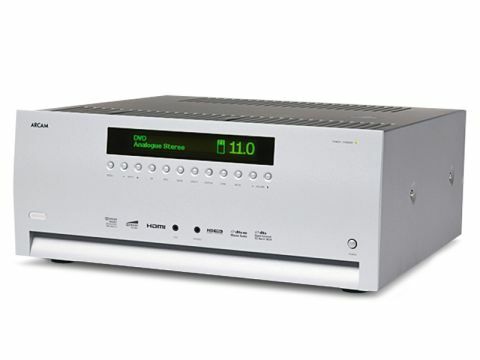 The AVR600 is an accomplished stereo performer, in its element with all manner of music, ranging from solo material (eg Suzanne Vega) to large-scale choral stuff (including Brahms' Requiem). It's worth noting though that this model is not overtly musclebound. Our tech tests tell an interesting story though. Our Power Output measurements confirm that while the AVR600 may lose out in a volume face-off, it has quality chops. We rated its power output at around 100watts with five channels driven, but it sounds a lot more empowered. Probably because, as our secondary Pure Power Fidelity Firewall measurement confirms, the Arcam will run at full-power without distortion. Other similarly specced amps may shout louder, but they pay for it in levels of THD. There are some caveats, of course. The user interface is distinctly Arcam and the GUI is particularly spartan when you venture into the world of 'net radio, while the backpanel labelling is at best odd (no BD-labelled HDMI?). The model also has a tendency to POP loudly when switching sound streams between BD menus and lossless codes. On the plus side, it boasts a well-conceived suite of video and audio technologies, gifted with a sound quality to warm the heart. For long-time Arcam fans, this is the most obvious of upgrades, and comes with an unreserved recommendation. And it may well convince others to follow. This truly is a receiver for all reasons.